Whissonsett is a small parish in the Breckland Local Government District, with an area of 555 hectares. 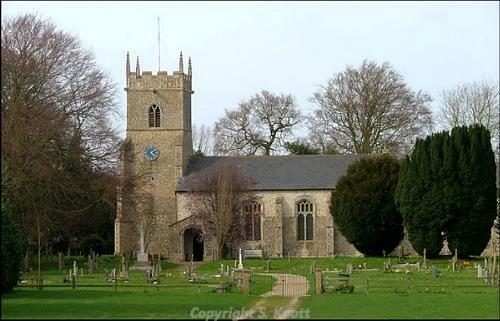 The parish is situated some 6km south of Fakenham, and is bordered by the parishes of Tittleshall, Colkirk and Horningtoft. The name ‘Whissonsett’ is thought to derive from the Old English for the fold of Wic’s people. The earliest objects recovered from this parish are a number of Mesolithic and Neolithic objects (NHER 31800), as well as a Neolithic polished flint axehead fragment (NHER 39362), which was recovered from a chicken run in Brickkiln Farm. The earliest monument is a possible Bronze Age ring ditch (NHER 31879), the cropmark of which was visible in 1992. 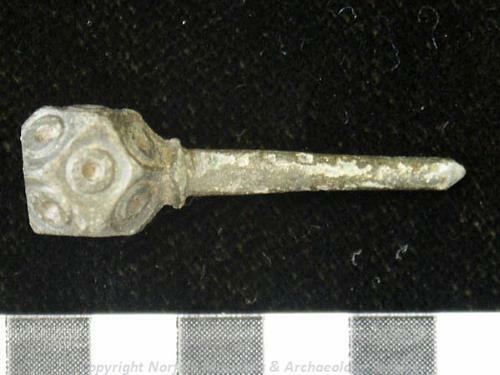 No objects have been recovered from the Bronze Age, but a terret from the Iron Age (NHER 39273) has been found. No other early monuments or objects are recorded, but a possible Roman kiln and iron working site has been discovered to the west of the present village. Ploughing in the 1960s brought a lot of Roman pottery sherds to the surface, as well as tesserae, the remains of a clay wall, as well as iron slag and charcoal. Roman objects have also been found, and these include brooches, a finger ring and other personal items (NHER 31800), coins (NHER 40866) and pottery sherds (NHER 41715), as well as a hair pin (NHER 50124). Objects from the Saxon period have also been recovered, although these are predominantly Middle Saxon in origin. This appears to be related to a Middle Saxon inhumation cemetery (NHER 40453) and occupation site that was discovered in 2004. Several human skeletons were noted at this site, along with shell fragments, pottery sherds and animal remains. Middle Saxon pottery sherds have also been recovered from another site (NHER 41768), as have strap ends (NHER 31648, 39273 and 50124), and pins and tags (NHER 31800). Late Saxon pottery sherds (NHER 41768 and 50124) brooches (NHER 39273) coins and other personal objects (NHER 31800) have also been found, as well as an Early Saxon cruciform brooch and small-long brooch (NHER 31800). Although no mention of a church is made in the Domesday Book of 1086, the head of a Late Saxon cross was recovered from the graveyard of St Mary’s Church. The cross is now preserved in the church, the earliest surviving part of which is thought to date to the Early English period. However the nave, tower and porch are all Perpendicular in style, reusing 14th century doorways, and the building received a thorough restoration between 1870 and 1875. The site of a medieval oval defensive homestead moat is also preserved (NHER 7170), and although the southern part of the moat has been filled in, the majority of it is well preserved and remains water-filled. Other sites include a possible medieval pottery works (NHER 13016) situated in a field referred to as ‘burntyards’, as well as a possible medieval cemetery (NHER 13016), where a number of bones including two skulls were discovered during the construction of houses. Also of interest are the earthworks of a medieval toft or enclosure (NHER 33793) and a number of linear features excavated in 2002 (NHER 37157) which may be medieval drainage or boundary ditches. A number of medieval objects have also been discovered, and these include coins (NHER 39273 and 44769), pottery sherds (NHER 50124) harness fittings (NHER 41715) brooches (NHER 31800) and domestic objects such as seal matrices (NHER 37196), keys (NHER 41768) and the guard from a medieval dagger (NHER 50124). Similar post medieval objects have also been recorded. From the post medieval period, the sites of a number of mills have been recorded (NHER 7178, 34993 and 34994) though no buildings survive today. Chuch Farmhouse is one of the few surviving post medieval buildings, and dates to the 18th century, with an off-centre two-leaf panelled front door. Slightly later in date is Whissonsett Hall (NHER 7170), a large two storey building of Flemish bond brick. Other features of interest include a mid 19th century well-head situated around 15m west of Springwell Cottages, as well a set of turnstiles and railings adjacent to this, also thought to date to the mid 19th century (NHER 46514).